Lizardmen are still relatively new army so I didn't know what to expect in particular. It turned out that Ben took something that I might call a classically looking Lizardmen army with some interesting twists. 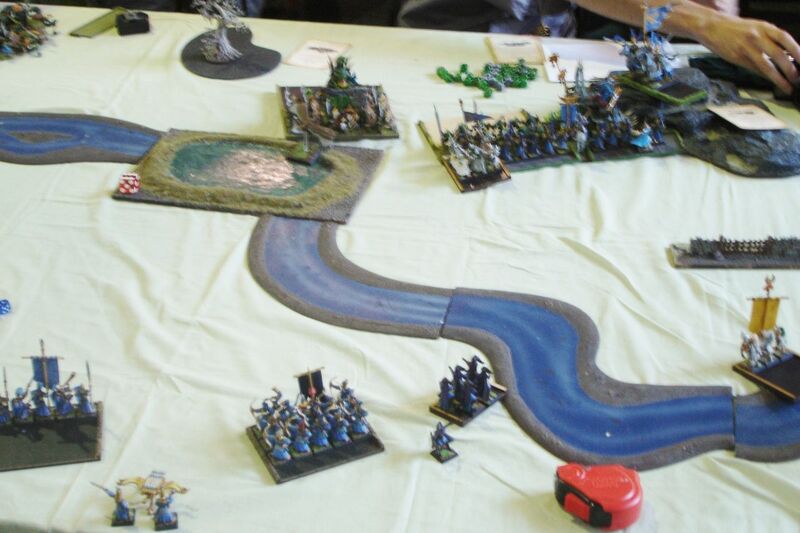 I become used to the Lizardmen armies with Slann with Loremaster ability (i.e. knows all signature spells) in the Temple Guard and some more Saurus Warriors forming the backbone of the army. They are very tough, numerous enough to shrug off some casualties and very good at grinding match. A few skink clouds nicely added to the army with their ability to be very annoying for almost all of my small and fragile units. I had means to deal with them and I had to do that in order to have more freedom in the movement phase. Stegadon Ancient was a very good addition too. This beast is really tough and hard to kill. What was more surprising is the presence of another beast, Carnosaur, ridden by the Scar Veteran. Fortunately for me I don't have any big targets for it to hunt. It still is very dangerous for my army as with plenty of attacks from both rider and mount as well as thunder stomps, there is a chance I might lose a unit per combat phase. Another novelty is ripperdactyl unit, further reinforced with the presence of the skink chieftain. He carried that accursed item that potentially can generate enough number of S5 hits to kill my entire units. It did happen before! So I was kin to get rid of that unit if I could! River across the battle field - curse or blessing? 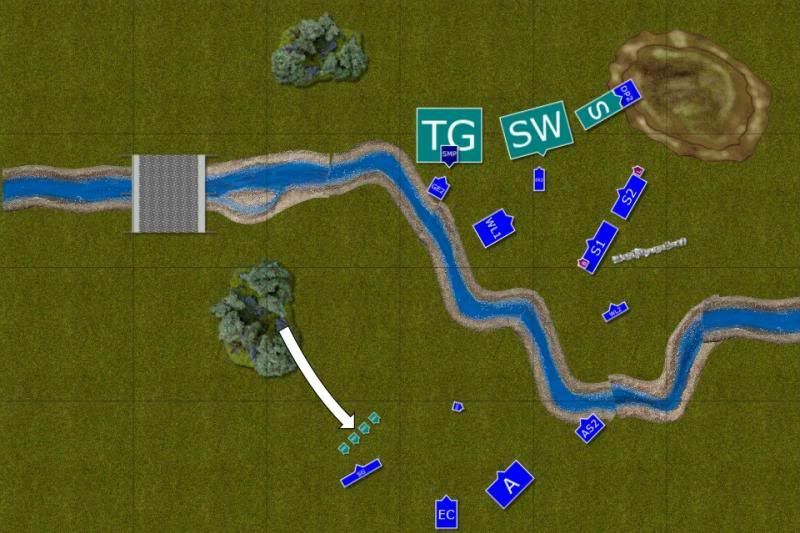 The main terrain feature that was about to determine the outcome of the battle was the river. It had a potential to either slow down the units (or more!) or to help me against these big blocks of saurus. 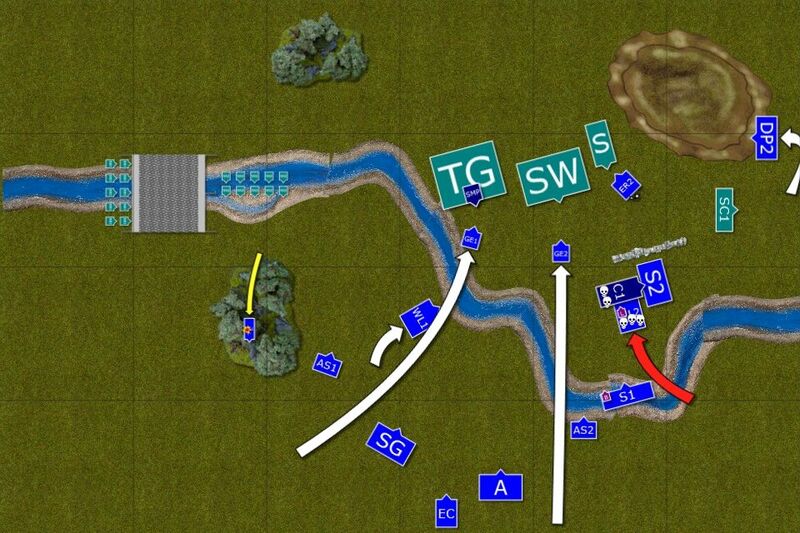 If I only could force a fight against them in the river then they would not have their ranks bonus. They would lose their steadfast option too, meaning, I had a very good chance to defeat them thanks to sheer number of wounds inflicted. 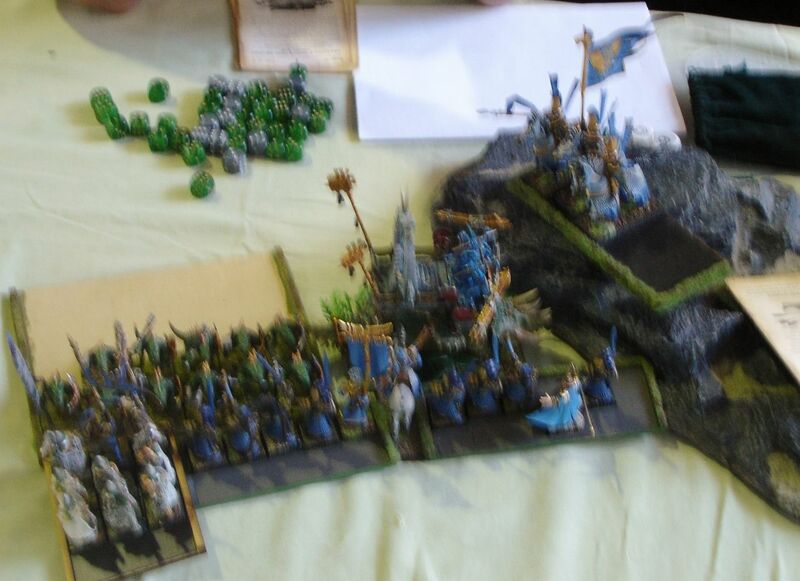 The Lizardmen characters deployed in their units i.e. Slann with Temple Guard and Chief with Ripperdactyls. 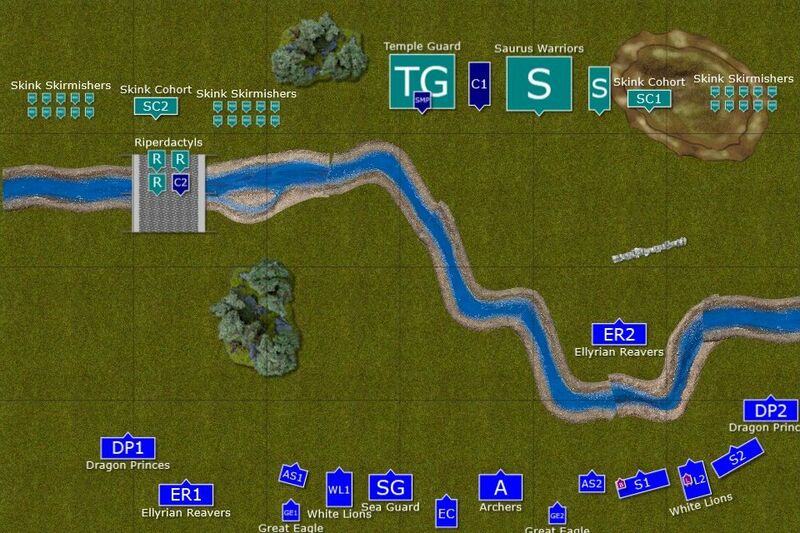 Loremaster joined Lions on the East while BSB led one of the regiments of Swordmasters to the battle. Surprisingly I won the first turn! That does not happen often! Elven army, using the opportunity granted by the seized initiative, move forward. 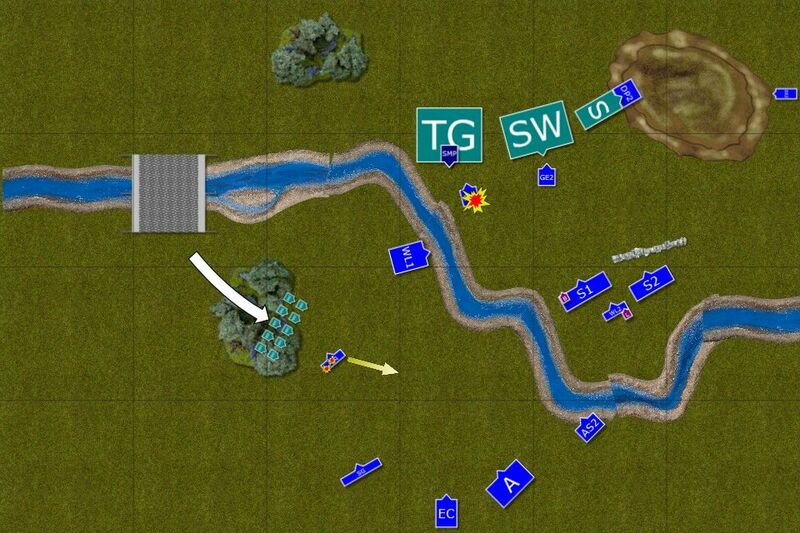 Some of the troops try to shoot at the big targets but the opening salvos were not yet successful. On the other hand, Dragon princes guarding the Western flank, made a very long charge when enemy ripperdactyls got a little bit closer. The skink chief cracked his accursed egg but even that didn't stop the eleven knights. They fought well and despite being the target of the curse of the frog, they defeated, broke and destroyed the enemy in pursuit. Nearby skinks were also panicked by this unexpected attack. Sadly, only a single knight survived that bloody combat and he was about to receive multitudes of poisonous darts from two other skink regiments closing in fast. At a mere gesture of the slann's finger the entire army starts moving forward. The huge blocks of Saurus stay together with Scar Veteran on Carnosaurus leading the way and Stegadon keeping up with the slightly faster pace than that of the infantry phalanx. 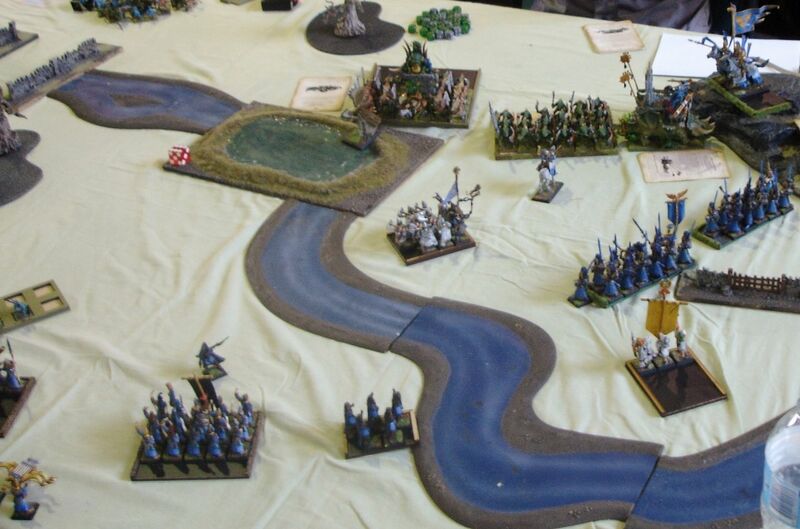 On the West, two skink skirmishers groups surround lone elven knight and even his ancient armour is not enough to protect him as one of the poisonous darts finds its way. Another unit of Dragon Princes charges the enemy! 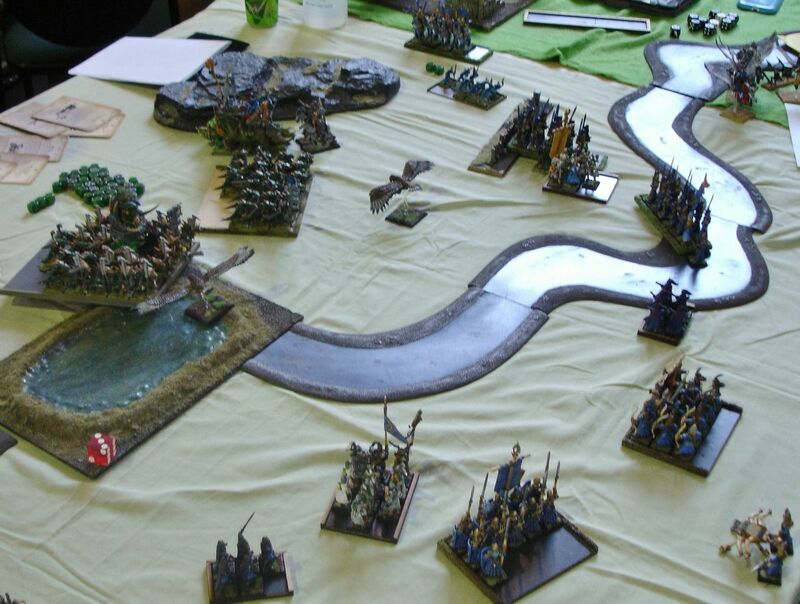 Some of the elven units advanced to have a better line of sight to the chosen target. Carnosaur roared in rage as some of the elven arrows actually managed to pierce his thick hide. But it didn't slow down its march. On the East Dragon Princes cleared the path to the enemy flank with a charge against Lizardmen skirmishers who tried to slow down elven knights. 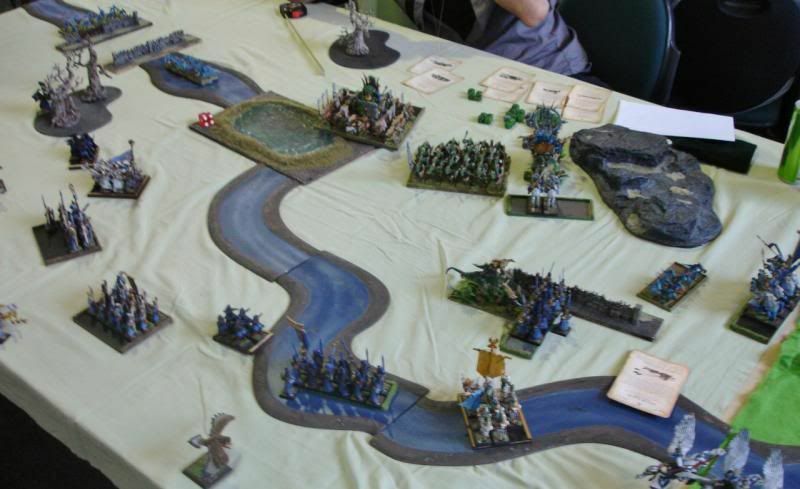 In a way they succeeded as some of the skinks fled the combat and overenthusiastic Dragon Princes pursued and temporarily moved out of the battle field. At the same time Ravers manoeuvred around another group of skinks and tried to tempt Stegadon to charge them. Seeing the exposed flank of the Swordmasters regiment, Scar Veteran pointed at them and his mount didn't need any further encouragements. However, lone figure stepped out from among the warriors of Hoeth and dared to call a challenge. Scar Veteran easily deflected the blows and destroyed his adversary. But was that really a victory? 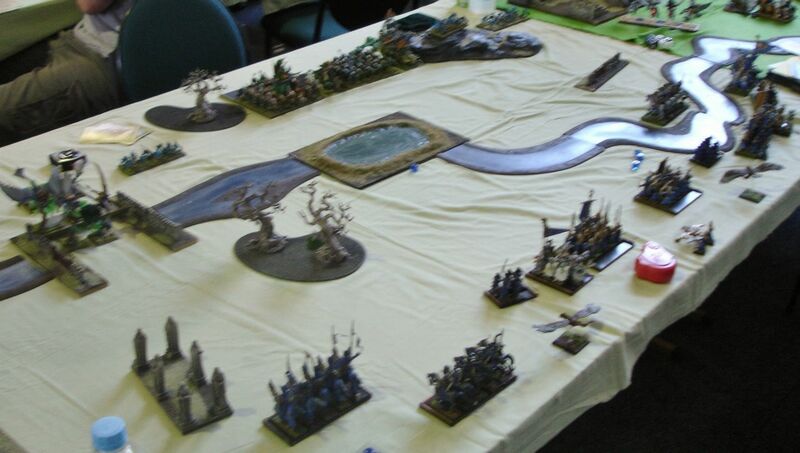 On the West skinks chose another target and this time it was elven fast cavalry. Lack of good armour was their bane and all but one rider died. The lone survivor had to withdraw if he wanted to keep his precious life. Another unit of fast cavalry was also shot at, this time by skinks from the top of the howdah on the Stegadon's back. 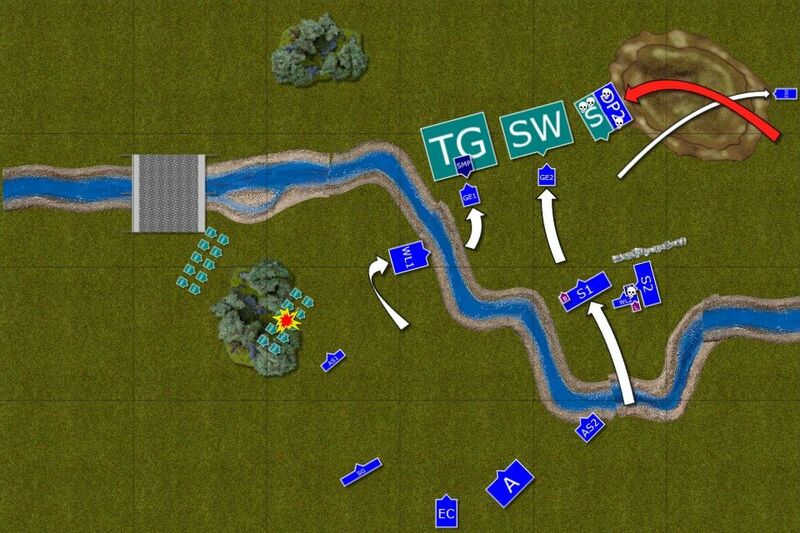 But despite heavy casualties they didn't retreat. 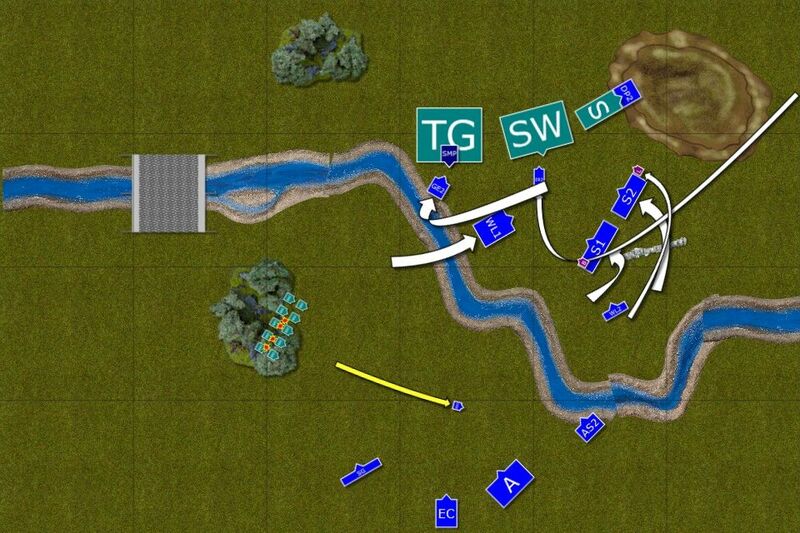 Fast, light units move in to block, redirect and bait enemy into traps. At the same time the shooters pick the Saurus unit as a new target and a few hulking warriors falls down. Loremaster leads his bodyguards to aid nearby Swordmasters in the attack against Scar Veteran and his mount. Elves managed to slay Carnosaurus before it started a bloody rampage but the Scar Veteran proved to be too tough and he also refused to give ground. Scar Veteran holds the line all by himself! Sensing the trap the Slann orders his units to pull back. 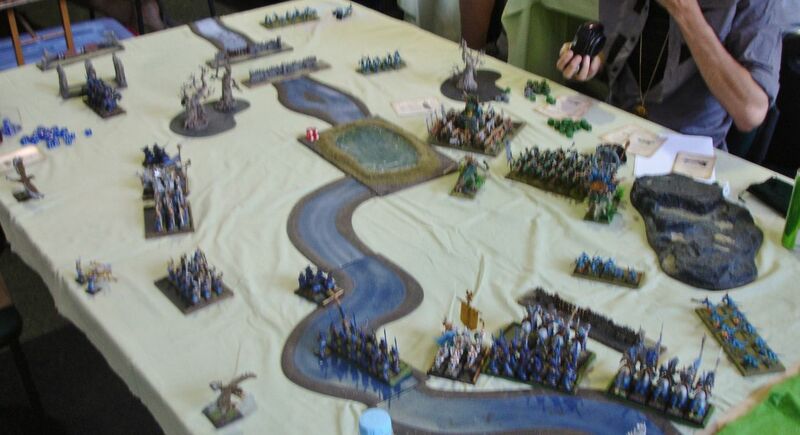 He didn't want to expose his Saurus to the charges of small elven units from multiple directions. Instead, he used magic and ordered skinks to hunt down elven light troops but these were not eliminated yet. Scar Veteran still refused to die and to give ground, keeping two elven units busy. Edit: It seems I forgot to show damage the Sea Guard too due to probably some fireball. The unit also fled because of that, apologies for the confusion. Charge of the Dragon Princes! Combined effort of the Swordmasters and White Lions finally brings the expected results and Scar Veteran is destroyed. 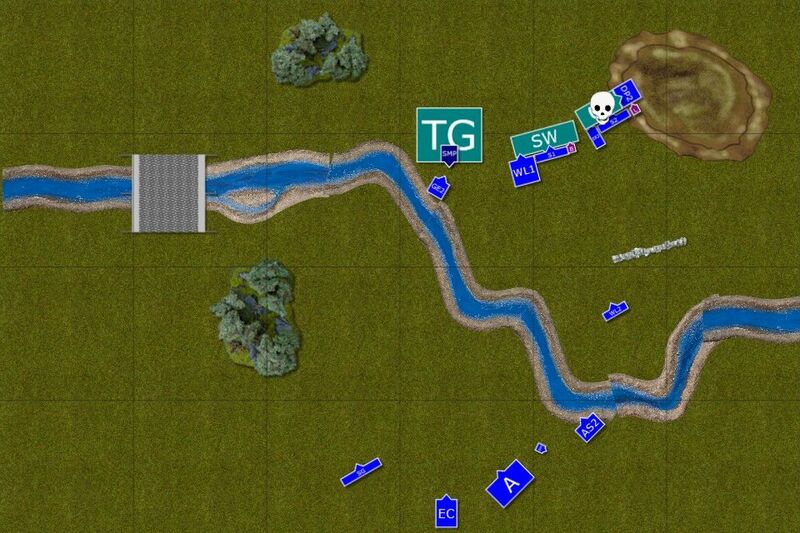 That opens the path for the elven units and they begin their advance towards withdrawing enemy. Dragon Princes attacked the Stegadon but the beast was hard to wound and it fought back. The knights still won the combat but stubborn beast didn't want to flee. With the elven assault teams still relatively far away, the Lizardmen army didn't move, consolidating their defensive positions. Stegadon tried to impale the elven knights with its impressive horns but they were too nimble for that. The combat continued! With the enemy refusing to fight, High Elves keep pressing forward. 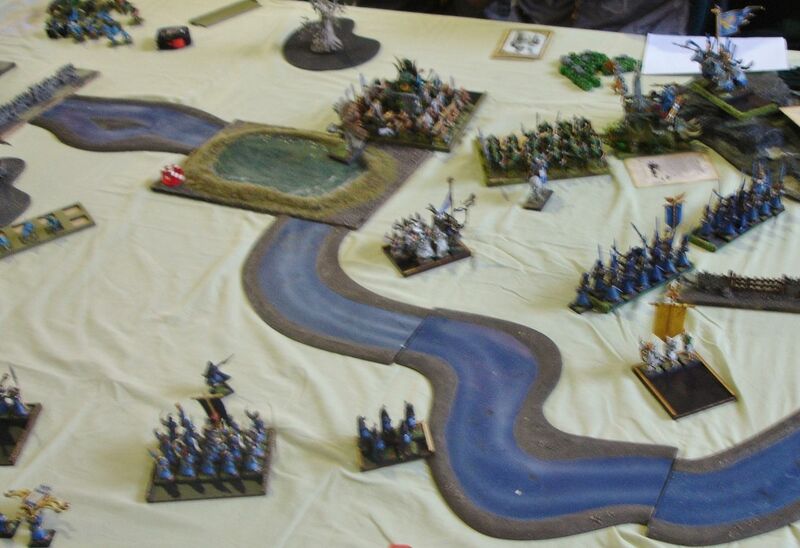 Swordmasters line up for the charge and Lions cross the river to participate in the combat too. Great eagle and brave survivor of the ellyrian reavers squadron keep distracting enemy infantry. The battle between Dragon Princes and the Stegadon is still unresolved. Slann, confident in his warriors skills, devoted his time to some important meditations, healing the Stegadon while doing so. Only skinks moved bravely forward, hoping to kill some more elves with their poisonous missiles. ... and bloody combat erupts! 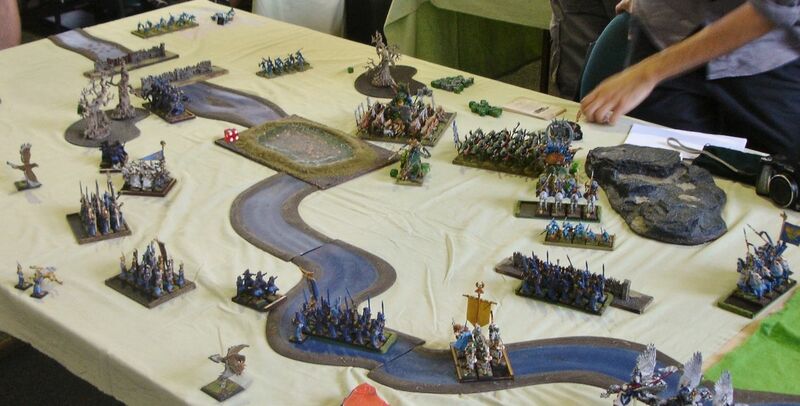 All available units charge the Lizardmen. Larry the Loremaster leads his Swordmasters to fight the Ancient Stegadon but are unable to finish off the beast that, although wounded badly, stomps many elves to death! At the same time, Bob the BSB together with second group of Swordmasters as well as Lions charge Saurus warriors. Many of the hulking Lizardmen fell to great axes and great swords but their counter attack is no less vicious. Casualties on both sides are horrendous. Saurus Warriors are hard pressed but they are steadfast and hold. Both armies or whatever was left of them, tried to push one more time. Elves finally managed to kill the Stegadon but the Saurus warriors proved to be too stubborn to give ground. 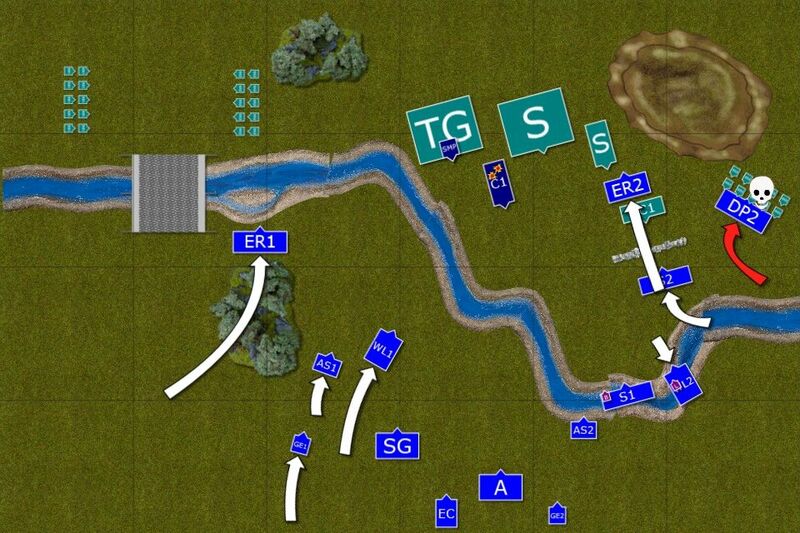 With last bloody blows not bringing more significant result, both armies disengaged and moved away to lick their wounds. High Elves paid bloody price for that hard won small victory. That was certainly one bloody battle! I am glad I managed to get that last combat but simply could not inflict enough casualties on Saurus Warriors to break their steadfast. In the first combat I needed one more casualty to be inflicted and one less wound to suffer to do so. As you can see it was very close! I was lucky with that first charge of Dragon Princes and I was ok with the exchange. While I lost powerful unit I also got rid of the dangerous ripperdactyls with the skink chief and got small skink unit as a bonus. I made a mistake with the Swordmasters, exposing the flank to the charge but looking at it again I think I might use that to tempt opponents to commit their units for such charges if I have a good counter charge ready. It played nicely to my advantage as I could challenge the enemy character, prevent deadly t-stomps and counter to kill his mount later on. It took quite a time to kill him though. That last combat showed something I need to take into account in my games. 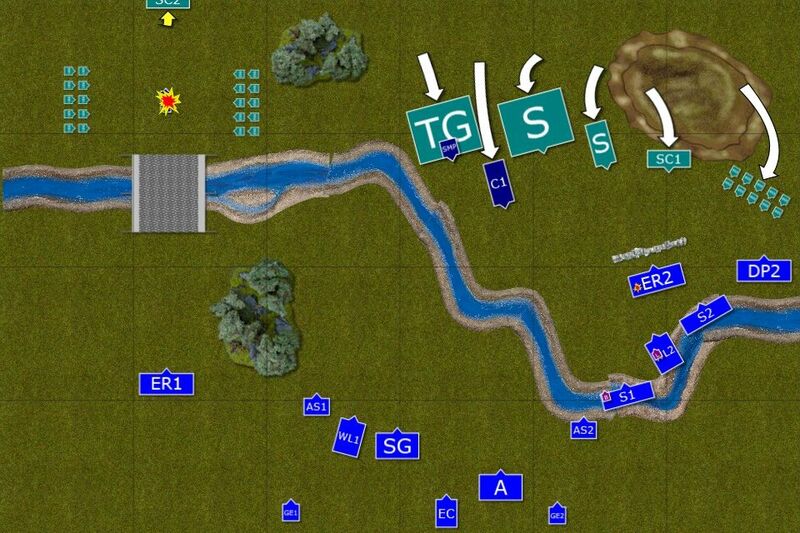 When the enemy withdraws the infantry may be too slow to get them early enough so that I am in position to attack from the flanks. 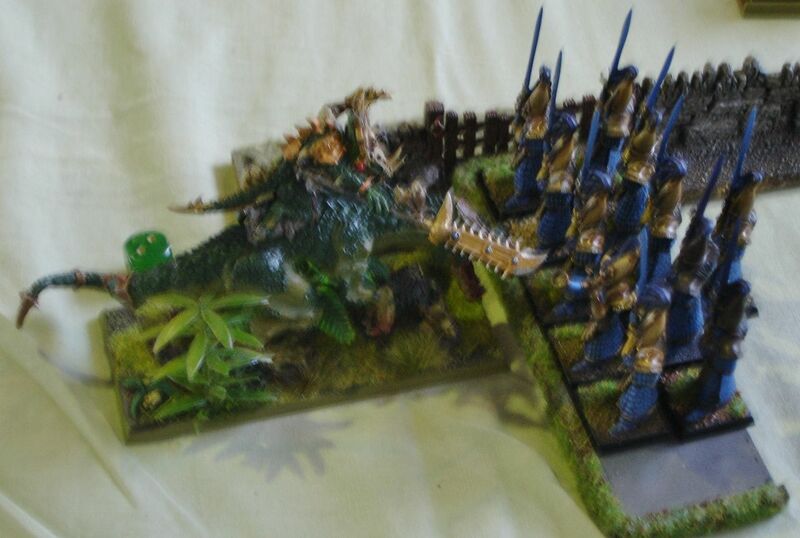 Frontal assault against Saurus is not the best idea ever as it was clearly shown. 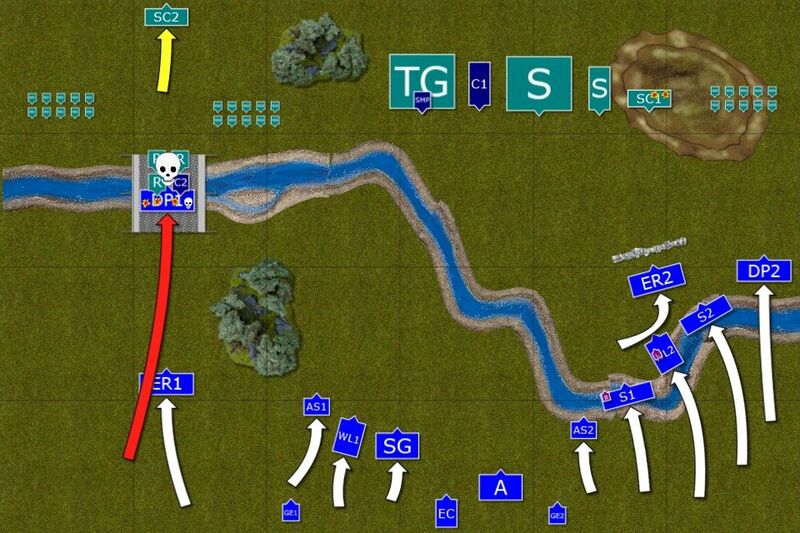 It was worth trying for sure but it was very risky as well as my units are not good at war of attrition. The good thing was that if that combat happened earlier, I would have had these regiments that defeated the Stegadon ready to help out. That poses an interesting dilemma, to sit at the back and try to weaken the enemy with arrows and magic but to risk that the earned points will be low? Or to move forward aggressively but risk confrontation with the enemy at better disposal? I also think I could have done better with the deployment. I think I should have moved shooting units more towards the right flank and approach the enemy from centre and left. That would have forced the enemy infantry to go through the river and allow shooters to pick better targets. It may have allowed for a more aggressive approach too. In any case, a 12-8 victory was still good for me!